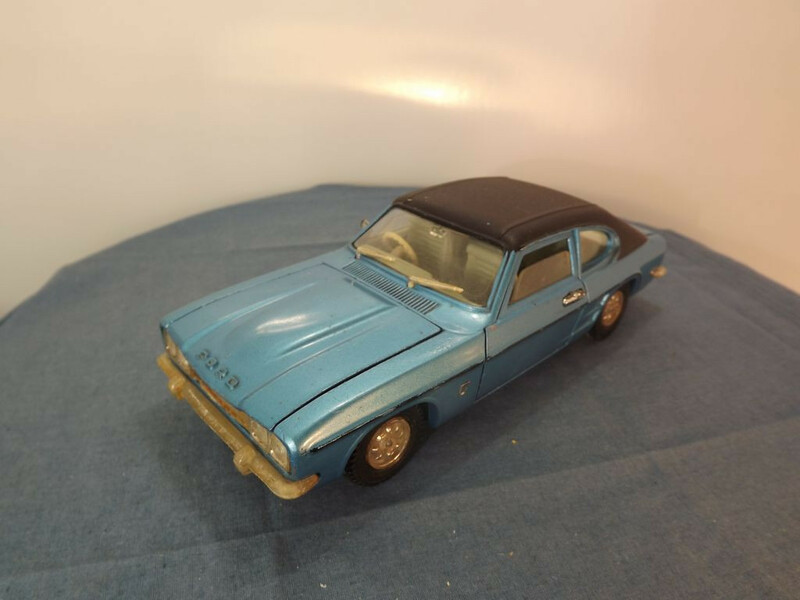 This model is the Dinky 2162-G-1 Ford Capri in Metallic Blue with black roof. This is a 1/25th scale item, one of three Dinky produced in the 1970s. This model features a multiple piece cast body with various cast plated plastic parts. The body casting consists of the roof and main body with separate cast metal bonnet, boot lid and doors. At the front the grille is plated plastic with 4 clear lenses for the lights. Below this is a plated plastic bumper with over-riders. The bonnet has the word "FORD" cast to the front. The windscreen has two plated plastic wipers, above the cast air vents, and the rear view mirror is cast into the windscreen. To the sides, behind the front wheel arches, are small silver labels that read "3000, V6" on two lines that represent the side badges. The cast doors have slightly open windows and plated plastic door handles, with the driver's door also having a wing mirror in plated plastic. In front of the rear wheel arches are cast vents again. Both sides feature a mask sprayed body line in black. At the rear the body has further cast air vents, a cast metal boot lid with "Ford GXL" – "Capri" is cast on the underside of the boot lid. Below the boot are two tail light assemblies in plated plastic with red and orange lenses and below these is the plated plastic rear bumper with over-riders. The roof is mask painted black and cast to resemble the vinyl roofing. The petrol cap is cast into the rear right hand side pillar. The interior is a greenish plastic, molded with dashboard, folding front seats, rear seats and driveshaft tunnel, a cream steering wheel and chrome plated "T shift" that can be moved. The glazing is clear all round with the rear window being cast with lines representing the demister. 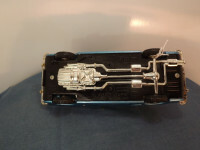 On this model there is factory casting fault in the rear glazing where one corner has not formed properly during manufacture, leaving an 8mm diameter hole in the bottom driver's side. The baseplate is black painted metal. 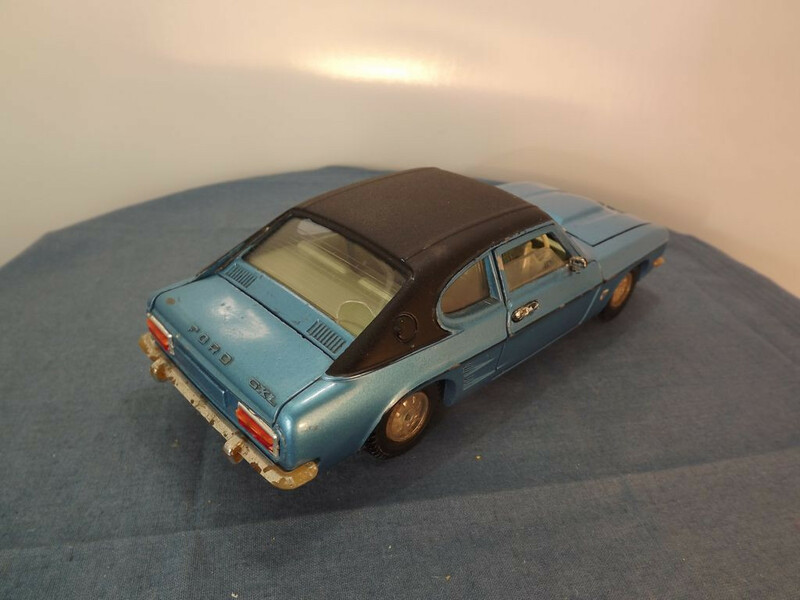 It is marked with "Dinky Toys" at the top right centre, just in front of the rear wheel, "Ford Capri" to the right bottom centre, and immediately below this, on a second line, is "Made in England". A separate plated plastic component provides representation of the lower engine block, exhaust system, gearbox, drive shaft, differential and rear axle. The baseplate is held in place by two self tapping screws. All wheels are black plastic/rubber with chrome plated plastic, cast hubs that appear to have been press-fitted to the steel axles. This model was issued between 1973 and 1976.